A powerful and comprehensive audio routing, control and distribution system capable of realising the most complex audio networks required by today’s broadcast facilities. Comprising single or multiple Nexus Base Devices (hardware racks) with an extensive range of audio and control interfaces, the network is completely configurable to suit many different broadcast, live-sound, post-production, outside broadcast or other professional audio applications. Capabilities include audio networking, data routing, format conversion, DSP audio processing and control interfacing to external equipment. 19” rack-mounting, frame sizes from 1U to 15U. 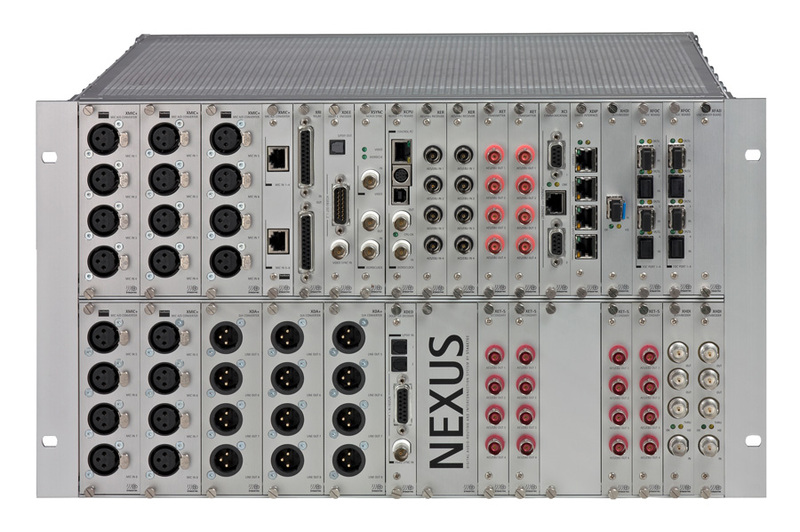 The Stagetec Nexus is a modular system, comprising 19” racks of various sizes, which can be loaded with audio, control and processing cards as required. Each rack is known as a Base Device. A single Base Device can form a stand-alone system providing comprehensive I/O routing, format conversion and processing facilities. Where studio facilities or other large infrastructures require more complex and distributed routing systems, multiple Base Devices can be employed, connected by fibre optic links. Each remote Base Device can then be configured with the appropriate audio and control interfaces necessary for the local application (recording studio, transmission room, dubbing room etc). Base Devices are available in seven 19” rack-mounting sizes (1U to 15U) and plug-in cards are either full or half-width. The 1U frame accepts up to 6 half-width cards, a 3U frame row accepts up to 20 half-width (or 10 full-width, or any mixture) cards to be fitted. Base Devices may consist of up to five frame rows. A wide range of audio interface cards is available. Cards can be mounted anywhere in the Base Device. Additionally, each Base Device requires a central controller module (XCPU) to be fitted. If multiple racks are to be interconnected then each rack will require an XFOC fibre optic interface board. Racks may be up to 60 miles apart. Each analogue audio interface provides dynamic range up to 133 dB(A) for line inputs and 158 dB(A) for microphone inputs. Digital audio interface cards are available with optional sample rate convertors and are certified by Dolby® to be bit-accurate and transparent to Dolby E.
Additional non-audio based interface cards are available including the NEXUS communications board, enabling direct communication with external devices such as AV control systems, logging systems or radio play-out applications. Other control interfaces enable a wide range of data formats to be routed across single or multiple Base Devices, including RS-232, RS-422, RS-485, MIDI, DMX and LTC. On-board DSP is another Nexus option. One or more signal processor boards can be installed to provide a scalable DSP architecture capable of forming the DSP core of a Stagetec console, if required. Redundancy and reliability are key features within Nexus. Back-up power supplies (no fans) can be mounted in the rear of each Base Device. Fibre optic links between Base Devices can be mirrored. Nexus cards are hot-swappable and come on-line within a few seconds of installation. An internal software monitoring system immediately detects any errors or failures in the Nexus network and reports the details to all connected control PCs or systems. Nexus also has a powerful embedded control system called Logic, that manages internal Nexus functions or controls external systems. Nexus Logic operates independently of any computer and can be easily configured to provide complex customised control functions or messaging.